Ready for shipment to anywhere in Australia. 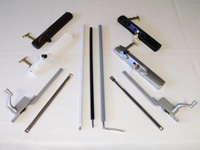 In fact, PC carry the largest stocks of door closers, floor springs, OHC transom closers & panic exit devices in Canberra! Progressive Controls also offer a select range of WINDOW HARDWARE for the handyperson, at better prices than the hardware stores.